The Long Beach Peninsula is an arm of land in western Washington state. It is bounded on the west by the Pacific Ocean, the south by the Columbia River, and the east by Willapa Bay. Leadbetter Point State Park and Willapa National Wildlife Refuge are at the northern tip of the peninsula, Cape Disappointment State Park, formerly known as Fort Canby State Park is at the southern end, and in between is Pacific Pines State Park. Cape Disappointment, part of the Lewis and Clark National and State Historical Parks west of Ilwaco, was the westernmost terminus for the Lewis and Clark Expedition, and a monument designed by Maya Lin as part of the Confluence Project was dedicated there in 2005. The Long Beach Peninsula is known for its continuous sand beaches on the Pacific Ocean side, 28 miles (45 km) in extent, claimed to be the longest beach in the United States. Because of the fine beaches, it is a popular vacation destination for people from Seattle, Washington, 165 miles (266 km) distant, and Portland, Oregon, 115 miles (185 km) distant. The peninsula is located entirely within Pacific County, Washington. Includes Cities/Towns: Ilwaco, Long Beach, Nahcotta, Ocean Park, Oysterville, Seaview. There are things to do around every corner on the Long Beach Peninsula, but here’s a list of our favorite picks. 1. Savor some of the freshest seafood you’ll ever taste. The Long Beach Peninsula is chock full of acclaimed restaurants serving up outstandingly fresh Pacific Northwest seafood, including Willapa Bay oysters, Dungeness crab and Chinook salmon. Try the mouthwatering crab roll at Captain Bob’s Chowder in Long Beach; or go for the Captain’s Platter at OleBob’s Seafood and Gallery in Ilwaco, a generous portion of fried cod, oysters, scallops and prawns. Local chefs also specialize in dishes using other super-fresh ingredients harvested on the peninsula, including more than 20 varieties of mushrooms, cranberries and an assortment of greens. Discover more delicious restaurants. 2. Connect with your inner beach bum. One of the most cherished Washington beaches, the Long Beach Peninsula’s 28-mile stretch of sandy paradise attracts horseback and bicycle riders, sand-castle builders and wave watchers. Several beach entry points are available along the peninsula’s entire western coast, including access from the cities of Long Beach, Seaview, Ocean Park and Oysterville. Catch a sunset for a truly unforgettable experience. 3. Let the kids loose at Funland Arcade. With old-fashioned pinball, laser tag and much more, Funland Arcade offers hours of entertainment. Located on the city of Long Beach’s picturesque main drag, the arcade is within walking distance of other kid-friendly fun, like The World Kite Museum and classic carnival rides, including a carousel, bumper cars and go-carts. North Head Lighthouse illuminates the way for ships approaching from the north, while Cape Disappointment Lighthouse in Ilwaco guides sailors into the mouth of the Columbia River from the south. The oldest functioning lighthouse on the West Coast, black-and-white-striped Cape Disappointment has complemented the park’s dreamy seascape since 1856. If you’re curious, English explorer John Meares named Cape Disappointment after his failure to discover the Columbia River in 1788. With a diverse landscape that includes old-growth forest and ocean beaches and opportunities for hiking, fishing, camping and much more, the state park and its cape are far from disappointing. 5. Celebrate one of Long Beach’s most cherished traditions at the historic Razor Clam Festival. Razor-clam-digging lessons, chowder tasting and a clam-fritter cook-off in the world’s largest frying pan are just a few happenings at Long Beach’s most iconic annual festival, a tradition established in 1940. Find more festivals and events on the Long Beach Peninsula. 6. Immerse yourself in southwestern Washington history. Long Beach Peninsula museums supply insight into the area’s rich history and heritage. Admire more than 1,500 kites from 26 countries at The World Kite Museum in Long Beach, the only U.S. museum dedicated to kites; discover the significance of the area’s 145-year oyster-hunting industry at Willapa Bay Oyster House Interpretive Center in Nahcotta or learn about the area’s earliest inhabitants at the Columbia Pacific Heritage Museum in Ilwaco. 7. Bag an epic catch in Washington waters. 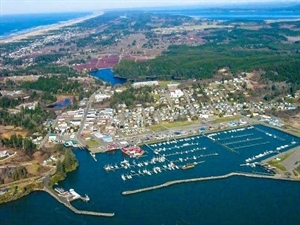 Ilwaco, known as the “fishing capital of the west,” has excellent Pacific Ocean and Columbia River salmon fishing. The village has a bustling port, where you can hook up with a fishing charter company and embark on the angling adventure of a lifetime. Other creatures worth hunting for include crabs, oysters and razor clams. Learn more about the area’s parks and ports. 8. Trace the footsteps of the nation’s most famous exploration duo on the Discovery Trail. The lovely 8-mile trail, established to commemorate Meriwether Lewis and William Clark’s journey from Ilwaco to north Long Beach during their historic expedition, is a favorite for hikers and bikers. For more background, stop at Lewis & Clark Interpretive Center in Cape Disappointment State Park for mural-sized timelines, hand-on exhibits and a glassed-in observation deck overlooking the confluence of the Columbia River and the Pacific Ocean. In addition to the mysterious half-man, half-alligator, other displays at the wild museum in Long Beach include a giant taxidermy collection, eight-legged lamb and antique gaming machines. 10. Gawk at breathtaking views of Pacific from the Long Beach Boardwalk. Windswept grassy dunes and seemingly endless ocean vistas make the boardwalk a haven for photographers, hand holders and those simply seeking an idyllic escape. The half-mile wooden walkway is especially mesmerizing during the annual Washington State International Kite Festival in August, when a symphony of colorful kites fills the sky above. 11. Browse Long Beach Peninsula shops for masterpieces by local artists, antiques and other one-of-the kind souvenirs. Home to an artistic community, the area has a wide array of boutiques, art galleries, antique stores and specialty shops. Find works by local and regional artists at Campiche Studios in Long Beach; or forage for hidden finds at Forgotten Treasures Antique & Collectable Mall in Ocean Park. Lots of our local restaurants have live music weekly. We have a small local hospital and clinics. Jan 35.0 F° 41.4 F° 47.8 F° 12.3 "
Feb 36.2 F° 43.2 F° 50.3 F° 10.4 "
Mar 37.8 F° 45.4 F° 53.0 F° 9.5 "
Apr 40.1 F° 48.1 F° 56.0 F° 6.3 "
May 44.5 F° 52.3 F° 60.1 F° 4.1 "
Jun 48.6 F° 56.0 F° 63.4 F° 3.1 "
Jul 51.4 F° 59.1 F° 66.8 F° 1.8 "
Aug 51.2 F° 59.5 F° 67.9 F° 1.9 "
Sep 47.4 F° 57.5 F° 67.8 F° 3.5 "
Oct 41.7 F° 51.5 F° 61.2 F° 7.2 "
Nov 38.6 F° 45.7 F° 52.8 F° 12.6 "
Dec 35.5 F° 41.8 F° 48.2 F° 13.3 "
With a marine west coast-cool summer Mediterranean climate, Long Beach is known for its year round mild climate. Both hot and cold weather is rare. Long Beach records nearly 80 inches of rainfall annually. Snow is not as common as rain, but can happen every once in a while. Condos Over 50 Communities Our peninsula is very diverse in housing. From manufactured homes to stick built and some vacant lots for RV hookups. Apartments are hard to come by as there are not many here. Due to being a tourist town we have a lot of vacation homes here also. Home care Senior center Visiting nurses We have three of four adult care homes and one assisted living facility. We have two home care companies. We are a small community that bands together to help our seniors get through rough times. Due to the many festivals and tourism, we have lots of opportunities for seniors to volunteer.